>Fashion: Computer bags get beyond "basic black"
> I’m mad for bags, and got to write about the laptop bags I saw at Macworld Expo for TidBITS, the Mac news site. Here’s the article, and a slideshow. The photo at right shows me wearing my fave bag, the beta version of a sling bag due out in May from the highly regarded Brenthaven company. 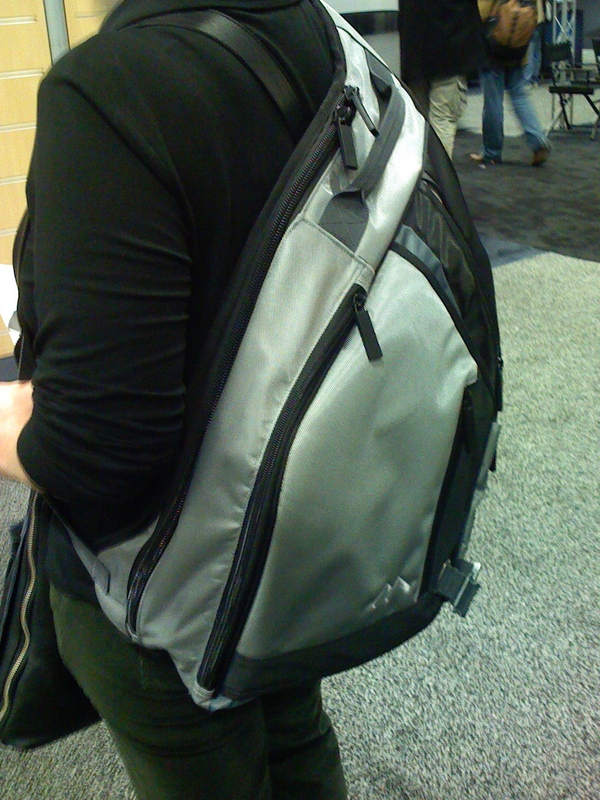 It turned out I wasn’t the only one prowling the aisles at Macworld in search of the coolest bags. You’ll find more bag reviews at Geeksugar (Melissa Beth bags), ars technica, SlipperyBrick (Targus bags), Laptops Arena (Clark & Mayfield bags), and Techie Diva (Urban Junket). Some reviewers were all about fashion and others were all about function. Ironically, while Crumpler blanketed the blogosphere with press releases about its new line of Squirrel briefcase bags, and won oohs and aahs for its creative booth (a castle) and swag (playing cards), the non-squirrel bags that make up much of the Crumpler line failed to impress me. Most are unconstructed, limp affairs that would look lumpy with a laptop in them, particularly if you tried to stow any odd-shaped accessories as well. Better save the Crumpler for when you’re packing just your iPod and a trendy sweater.